Ocean Science Trust created OceanSpaces for the California ocean community. 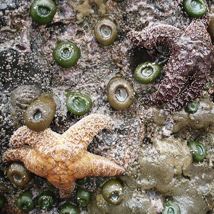 OceanSpaces is dedicated to a vision of healthy and productive California oceans through science-informed ocean resource management and stewardship. The platform brings everyone together with a stake in the health of California’s oceans offering new opportunities for you to communicate, create, and share information. Whether you are a fisherman, diver, environmentalist, resource manager, scientist, or neighbor to California’s ocean, we invite you to join the community. A shared body of scientific knowledge enables us to make informed decisions and becomes the basis for participation in the decisions that will shape the future of our oceans. As the official stewards of marine protected area monitoring for the state of California, OceanSpaces offers a breadth and depth of information not found anywhere else within the ocean community. We also have a unique measure of success…member participation. The OceanSpaces experience is driven by the diverse and unique contributions of our members. Read more about how MPA monitoring is tracking ocean conditions.